Ever since the change in Daylight Saving Time, I’ve tried to be mindful of leaving my office by 5 PM in order to avoid being inside the prison at dusk. 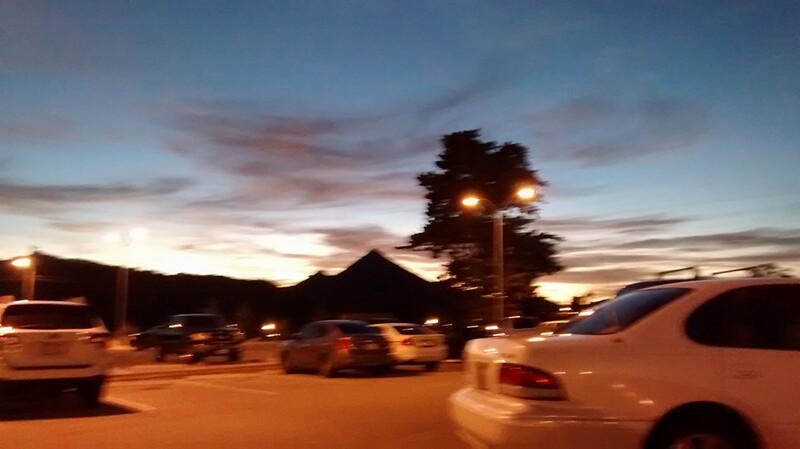 Unfortunately, today was a really busy day and I had a lot of paperwork to complete, so I didn’t officially walk outside of the facility until the sun had almost set behind the mountains. That’s okay, though. I didn’t make a whole lot more progress on the mitered squares blanket, so instead I’ll share with you a blurry photo of our parking lot as I was leaving work.